Vaders is a well-known IPTV service that provides plenty of extra features to set itself apart from the competition. Their unique Kodi add-on to fully integrate live TV streams and an online portal to stream from virtually any device are killer features that make this one of the most user-friendly IPTV provider. We get our subscription from the reseller IP2Box that offers the full package at a lower price than the original provider. And, you get great support free of charge! Vaders keep things simple for their clients. There aren´t half a dozen different options when it comes to their services. It is one package offered for different time periods, becoming cheaper the longer you subscribe. What truly sets this IPTV service apart is that you can use Vaders from 5 different devices, at the same time! There are other providers that allow multi-usage, some at an extra charge. But we haven´t come across a single one that grants you five simultaneous streams. We subscribe through our trusted reseller IP2Box to get the best bang for the buck as they undercut the provider by a significant margin. Also, another advantage of using this reseller is the option to use different payment services. You can either subscribe via Paypal, Credit Card or even Bitcoin. So, if you value your privacy, cryptocurrency will be your best option. Of course, signing up via IP2Box will have no disadvantage, you still get the full access to Vaders services and platforms. 12 Month – 125 USD -30%! Regardless which subscription you choose, you get access to Vaders online streaming platform that can be used with any browser, their Kodi add-on, as well as M3U links. No matter how you choose to use Vaders: VoD, live TV channels and their Matchcenter that combines all live events for easy viewing are easily accessible. Content is King at Vaders! This service has all bases covered with an impressive channel line-up, a solid EPG, and an on-demand video section that puts many other providers to shame. The best feature of Vaders, however, is their Matchcenter. First, let us start with an overview of the content you get. Live TV: Whilst Vaders might not have the highest number of channels, they certainly cover anything most users might be interested in. Of course, you get the usual English Entertainment, News, Documentary channels. They also have an impressive Sports line-up. And, their International coverage is actually quite good. Philippines, Ireland, Germany, Italy, Asia, India, Middle East, Latino, Scandinavia and many more! Video on Demand: Vaders does not disappoint here, either. Over 2500 movies and 300 TV series are waiting for you. Another section that Vaders has is called the Matchcenter. 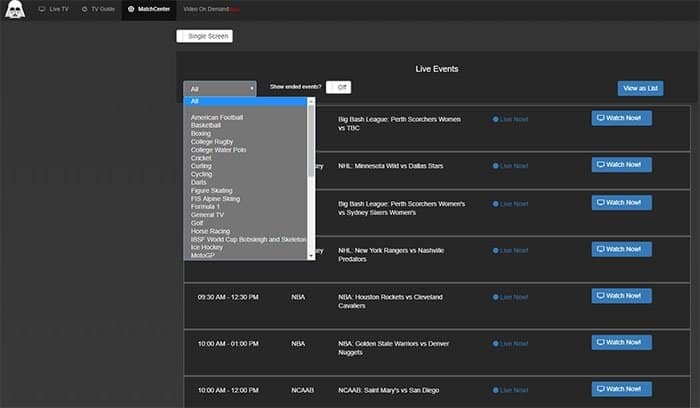 This is a central listing of all sports events for the day, each linking to multiple channels. This is a great feature as it lets you to simply scroll through the list and pick a game that is on. Best of all, you can pick from several channels, many times in different streaming resolutions, to make sure you get a smooth viewing experience. Finally, Vaders also has a catch-up feature that lets you watch shows for up to three days in case you missed them. This feature is available on almost all US channels. However, we found that this still needs some work on the provider´s part as sometimes we weren´t able to access the recordings. With such an impressive line-up of features and content, keeping everything running smoothly must be a complex operation. Luckily, we found that Vaders performs extremely well, even during peak hours. Switching TV channels felt close to what you would get on cable. The streams themselves are great quality. We rarely experienced any lag or buffering during our use. The odd channel can go down from time to time, but with so many options to choose from, you usually have another channel showing the same show or game. Having said that, there are some issues, as is the case with any IPTV service. The accuracy of the Electronic Program Guide is a hit or miss. Shows can be mislabeled which makes it difficult to navigate the long channel list. Also, catch-up is not quite there yet as we had some issues getting it to work in some instances. However, from an overall TV experience point of view, there aren´t really any other providers that can substitute Vaders. Their streaming platform is fantastic, the quality of the streams are great, there are tons of channels and movies, the Matchcenter can literally change the way you watch Sports, and catch-up is super convenient when it works. The only real downside for Vaders is that they had some outages in the past. However, they seem to have taken care of those problems and the service has been running strong from us for some time now. Vaders makes accessing their service really easy. They run their own repo service from which you can install their Kodi add-on without transferring files or downloading anything from the Internet. Once set up, Kodi automatically pulls in the EPG data and links all their streams for easy viewing. Of course, you can also use Vaders with your Android TV box without having to install Kodi. Using their M3U playlist, it is easy to set up one of the many IPTV apps on the Play Store. Stalker middleware is also an option that will allow you to use your IPTV set-top box with Vaders. Last but not least, Vaders also offers the best online streaming platform that we have seen by any IPTV service. All features available on other devices can be used by your PC or Mac without installing or setting up any software.